Allocating is the process of matching open invoices, credits and on account payments. When a payment is receipted directly against an invoice they are automatically matched together, but if the payment is placed on account it will need to be matched with the invoice(s) by allocation. 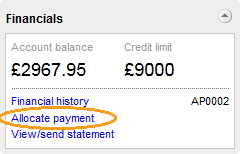 This is an example of a customer's account - viewing the payment allocation screen. There are 2 unpaid invoices and an on account payment, however, the customer's overall account balance is zero. Until the payment is allocated to the invoices they will remain open and appear unpaid. This means they will continue to appear on the unpaid invoice report. They can be allocated and matched together in order to clear all the items from the customer account. This is done buy marking each of the invoices and the payment as paid, so that the overall payment amount being processes is zero. In the above image the invoices are paid in full by the on account payment, but where the payment only partly covers an amount of an invoice the paid amount needs to be typed into the field. In this example the invoices total £350 but the on account payment is only £300. £150 has been paid off each invoice and the full payment amount cleared, this will leave the remaining £50 on the customer account to be paid later. In this example a payment of £50 covers the outstanding balance on the first invoice and the sales credit reduces the balance of the other invoice; the rest of which (£200) will remain on the customer's account. Note that prior to version 4.90 you could correct this error by editing the journal. Now that order payments have been introduced it is not possible to correct it via accounting. If the journal is edited this will fix the error on the supplier financials but the order will remain overpaid. When the overpayment is later allocated to another order the payment amount is recorded against that order as well - the result is the overpayment is duplicated on your purchases reporting, however, your accounting is correct. Search for the contact account. Click to open the contact record and navigate to the payment allocation screen via the financials box on the right-hand side. Next to each item to be allocated fill in the To pay now field with the amount to be cleared, e.g. if you have an invoice for $10 and a matching payment of $10 that you wish to match together, enter $10 against both. If you are matching 2 invoices of $5 each, and a payment of $10, enter $5 against each invoice and $10 against the payment. If you have a payment that doesn't fully cover the invoice you can only allocate the amount of the payment, if the payment is $10 but the invoice is $12, enter $10 against both, the remaining $2 on the invoice will be outstanding on the account. Ensure the total at the bottom is ZERO, you are not taking any payment, just matching. Select the bank account and if you want, enter a reference. As long as the total is zero click the Allocate payment button to finish. This creates an accounting journal to match the order reference to the payment reference.